Oh man! I am in agony reading this post and knowing that the chances of me and this wild boar bacon ever meeting are slim…it looks and sounds INCREDIBLE! Hey EXCELLENT bacon review! Ain’t seened it here. MMmmMm, bacon. Curses! Shipping from Exotic Meats is soooo expensive. I may have to pony up…. Wait, wait, wait. Let me get this right. This entire blog is dedicated to bacon? Kevin, It really is worth groaning over! Thanks Robert! I was so happy and delighted to see so many MEAT awards this year as well!! I know, it is pricey… but maybe you just need to get all your friends together and place a huge order. Exotic Meats sells a lot of fantastic things—my favorites being anything wild boar and their elk tenderloins. Mmmmmm. Using the B.R.S., what score would you give to Kevin Bacon? Great post, Meg, I really like your scoring system. Cooking anything with nitrates, as opposed to nitrites, at low heat is a good idea anyway, because exposing nitrates to high heat can create nitrosamines, which are carcinogenic in large amounts. Nitrites are safer in that regard. Please excuse this public comment (I could not find an email address on your site). I know that you are out of Seattle and I’ll be going there in mid-May. I wanted to know if you had any food suggestions. send an email along if you can. Have you tried any of the other wild boar products from the site? Sal – Surprisingly, I think that’s the very first reference to Kevin Bacon on my site. Ha ha! You should win a prize or something. I’m actually not a huge Kevin Bacon fan, so I think his rating might be a tad low… he definitely errs on the side of too chewy. Thanks Steve! I’ve tried some, but not all of the other wild boar products. The wild boar patties and the sausages are both great. I really want to try that shoulder roast though… I bet it’s spectacular. What a great site you’ve got here! Such an obscure topic, and such illustrious descriptions and photographs! If you are into food blogging, which it seems that you are, you should check [this out] ! Take care! Your link didn’t come through… can you post the url again? Mmmm. I heart prosciutto as well, Tracie! 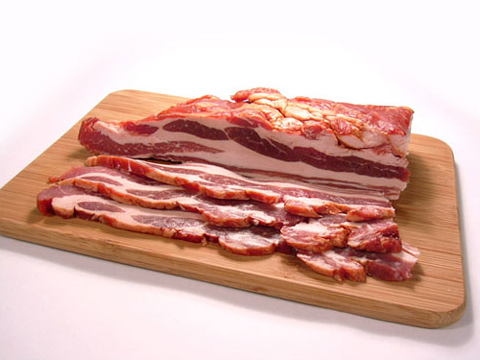 Oh man…I can’t believe I’ve come across this site dedicated to bacon…this must be shared with others! Boy! And I thought I loved bacon. Great site, great recipes, although I expected them all to have bacon in them (for some reason.) Thanjks for the site. Ha ha! Thanks Rex. For all bacon recipes, all the time, you should check out The Bacon Show. YUMM! Ha ha! Yes, little delicious boars! i absolutely love bacon!! thank god i found your blog!!! cheers!! Fabulous site! The whole idea of blogging bacon is seriously interesting in itself – helped along of course by the way we heart bacon so! I just came across your site! I too am a bacon lover! I searched but couldn’t find anything on your blog regarding scrapple…or what my father calls “everything but the oink!” Have you ever eaten (or written about) this particular pork product? Wow, I am salivating! My cheeks hurt. Megan – you are awesome! I like the applewood smoked bacon (for traditional bacon mind you) at the Broadway grill. Just a bit chewy and I could eat a whole plate of it! Welcome back to MEAT! 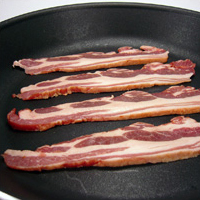 If you love it as much as me than this bacon is for you. Bacon in a can. Yep, I found it and ordered it from a company called ready depot. http://www.readydepot.com . There was about 45 slices, cooked 75 percent of the way and ready to eat. I put the first 5 slices on a blt. THe next morning I through another 5 slices in the pan and crisped them up a bit. There was still enough oil in the bacon to fry my eggs afterwards. This is good stuff. 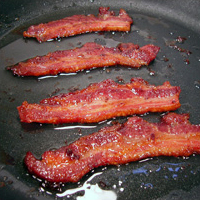 We are having Baconfest 4 on Sunday Aug 31st from 5pm-10pm. We had apporx 75 people last year and are looking for many more this year. Prizes are awarded to the ‘best’ bacon dish entered! You are all invited, please come and celebrate this bacon FEAST! Tasty foods and looking great, I like very much. Thanks for sharing these kinds of foods items.